Three months ago today I launched 'The Ultimate Silhouette Guide'. In those three months more than 3,500 copies of the ebook have been sold...and lots of things have happened on the book front. Will 'The Ultimate Silhouette Guide' be updated? Yes! When significant enough changes occur to the Silhouette machine and/or software, such as the software changes and updates expected later this year, I will write an appendix to the ebook. It will be offered as a free downloadable PDF file, like the ebook, to anyone who has purchased the digital version of the 'The Ultimate Silhouette Guide'. When it becomes available, an update will automatically be sent as a free download link to the email address or paypal email used at the time of purchase. I will post an update on the blog announcing the release of an update. Is 'The Ultimate Silhouette Guide' only available as an ebook? At the moment, yes. However, you can have it printed and bound (Need a print consent? Just ask!) and you can also read it on an iPad. Will the book ever be released in hard copy? 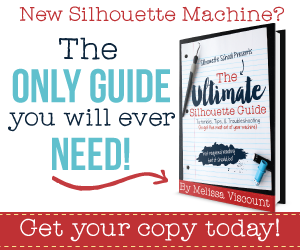 After much thought and months of begging from many readers who say they just can't 'do' an ebook, I am moving forward with self publishing The Ultimate Silhouette Guide as a paperback book. This is a huge undertaking on my end as you can imagine and requires some modifications (in printing not content) before it can be released in hard copy. I received the first proof last week and am working on a few necessary changes for the printed version. While the book will be released in paper back, I am really encouraging you to consider the ebook for several reasons: 1) Due to things such as mass printing and distribution costs (which are non existent with an ebook version) the paper back will be sold at a higher price point. 2) Also, again due to complications that don't come into play with the digital ebook version, the paper back copy can't be updated nearly as frequently or as easily. So those updates I referred to above won't be available to those with the paperback version. When and where will the book be available in paper-back? My best estimate would be in July, but an exact date is still TBD. When it's released, the book will be available exclusively through my websites - Silhouette School Blog and Silhouette School ebook. Please sign up for the Silhouette School newsletter and/or Facebook update notifications to be notified when it's available. I know there are a lot of Silhouette users are who are still on the fence about purchasing The Ultimate Silhouette Guide for one reason or another. So, to celebrate the three month anniversary of its release and to show you what you're missing out on, I'm offering everyone a chance to download a chapter of the ebook - for free!! This offer will only be good for a limited time only so if you're even remotely thinking about purchasing "The Ultimate Silhouette Guide" now's the time to get a real good sample of what you're be getting with the full purchase. This chapter is just four pages of the 145 page eBook but it's a great example of the jam-packed pages filled with step by step tutorials and images in a logical and easy to follow order. If you like the free chapter, come on back for more! 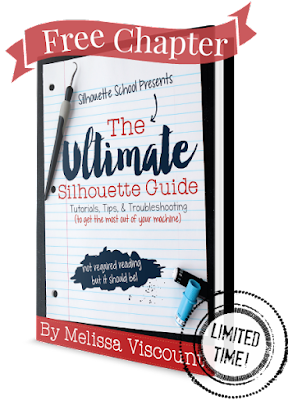 Buy the complete Ultimate Silhouette Guide..it's the only complete Silhouette guide out there and it's the only Silhouette guide you need! Thank you so much for the "free sample" of your book. It very well done with pictures, text and helps. I can't afford the whole book right now but I'm putting it on my Christmas list. Thanks again. After reading the "free" chapter, I would like to get your book. I was wondering if it is based on the current SIL Designer edition version 3.3.638? Hi there, The book came out in March of this year and 3.3.638 came out less than a week ago - so the short answer is no. However, the book was written with a previous version of SS DE V3 which is very similar to 3.3.638 (I just updated to it and can't even tell a difference). I bought your book but haven't been able to sign on to it. I just got a Silhouette, signed up for Silhouette Connect so I could send files direct from Illustrator. All I am trying to do is cut out applique templates from my pattern files. I printed and read the Connect manual but it is as if half the information has been left out. Does you book speak to Connect information or Designer Series. Very nice post. I am trying to do is cut out applique templates from my pattern files. This is the simple business proposal letter here. You can choose your letter business proposal.